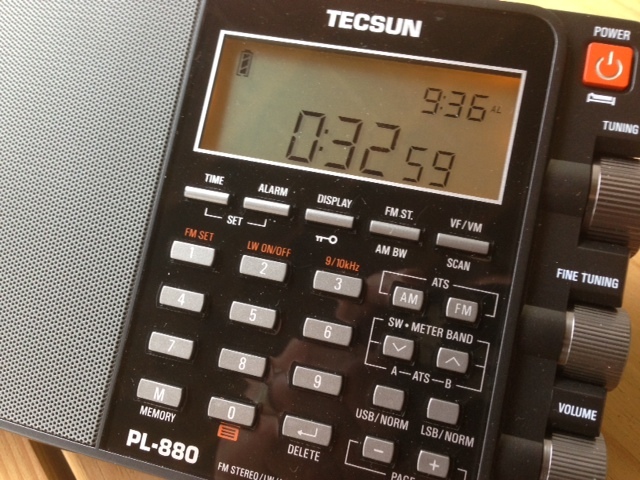 A very simple hidden feature: by turning off your Tecsun PL-880, then pressing and holding the number 8 on the keypad, you can turn on the PL-880 clock seconds display. Use the same process to toggle between settings. This entry was posted in New Products, News, Radios, Reviews, Shortwave Radio and tagged PL-880, Tecsun, Tecsun PL-880, Tecsun PL-880 Availability, Tecsun PL-880 eBay, Tecsun PL-880 Hidden Features on December 5, 2013 by Thomas. A big question is whether the radio firmware can be upgraded by the user in the future to address some minor issues. Is there any indication of this? Can you maybe ask anon-co? You mentioned the possibility of a hidden feature that would allow the zeroing of the display frequency when tuned to a standard (say WWV). Any news on this one? When a receiver can display a frequency to the nearest 10Hz, it would be nice to get it on the money.